The Yamaha XJR1300 has been around for over a decade essentially unchanged! I love the look of the XJR1300 (2016 model) as I think its a classic design appealing to retro buyers and those who want to tinker and modify. The design is very 1970’s just before the sports and fully faired motorcycle trend in the 1980’s. 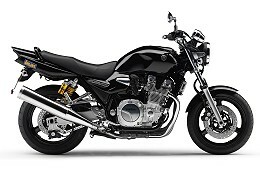 The other main attraction of the XJR1300 is 1300cc engine which produces huge torque at low revs. It has small car power in a easy to handle package with just a some excitement if you wanted it’ll go only as fast as you are capable of handling. Suspension is comfortable and plenty of power to deal with any sort of traffic. The naked frame work also allows customisation and easy to do regular maintenance. The XJR1300 in my list of notable naked motorcycles for keeping things simple and relative inexpensive. Riding the XJR1300 is all about the experience and there’s something emotional about the design – keeping something the same for so long. I also like the look which is unusual for me since I do prefer ‘futuristic’ designs.